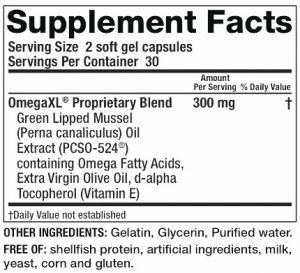 Omega XL, sometimes labeled as the “secret” cure for joint pain, has a unique ingredient that makes it as effective as normal fish oil while eliminating the complications that come with it. 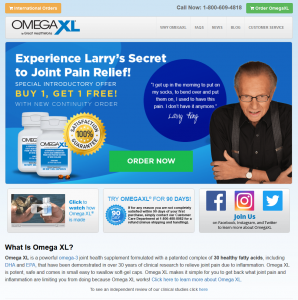 This product that is highly promoted by Larry King claims to reduce inflammation, stiffness, pain, as well as bronchial tightness that is usually associated with asthma. An effective relief for joint pain, inflammation and stiffness. Contains toxic free ingredients that eliminate the side effects when joint pain is gone. Contains potent omega-3 complex with 30 fatty acids. 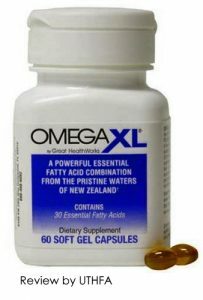 Below are reviews from real customers who have tried Omega XL. Feel free to leave your own review. My husband had a back surgery last year. He’s been using this for almost one year now. I order all the supplies from Amazon so there was a time when I was not able to order on time and his supply was delayed for a week. He mostly stayed in bed and couldn’t move much. He’s much better now after therapy but will be needing more of this oil. Not sure what it has that eliminated my frequent diarrhea. I also had a lot of leg pain and I noticed that my pain is much improved now. I just think it’s overpackaged. I have already canceled my subscription 3 months ago and never received a bottle again. Today I was so surprised that I received a 2-month supply of this product. I already contacted the bank but unfortunately, they have no way of canceling the auto-ship. I called the customer support again but they said it’s already canceled from their end and will check again. They did not assure me that I won’t be getting more bottles or I won’t be charged again. I was curious about the hype that surrounded this product so I bought one. My pain is still the same after a month. I believe that antioxidants are important for inflammation, but I think this doesn’t have enough concentration to be that effective in alleviating pain. They kept sending me bottles so I asked the bank to cancel my credit card and send me a new one. I guess I’ll just have to stick with a less expensive alternative. I’ve been using this for 2 months already but it doesn’t relieve my pain from arthritis. I already called the company for a refund but just now, they charged my credit card again and sent two bottles in two weeks. Avoid this company! Omega XL rated 3.4/5 based on 25 reviews. PCSO-524 (Perna Canaliculus): A marine oil complex extracted from Green Lipped Mussels harvested in New Zealand. It contains 30 fatty acids which include DHA (12%) and EPA (18%). Vitamin E: A powerful antioxidant that reduces inflammation. Olive Oil: An anti-oxidant that contains oleocanthal which is a proven effective anti-inflammatory agent like ibuprofen. 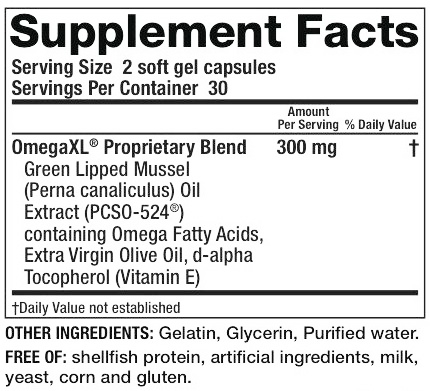 Omega XL is usually referred to as Super Oil because it contains 22 more omega-3 fatty acids. These fatty acids work together to battle against inflammation. The capsule has convenient-to-swallow feature making it very easy to take. Two capsules must be taken daily, in either one or two servings (morning and evening). For best results, take the supplement with meals and lots of water. Has a 100% money back guarantee. Comes with a free bottle on the first order. Made from high quality, safe and natural ingredients. Does not have a fishy aftertaste. Safe for people who are allergic to shellfish. There are no published clinical trials that can prove that the product was clinically tested as declared by the manufacturer. The manufacturer participates in the auto-ship program. A complete list of ingredients is not listed on their website. There are no known or reported negative side effects of using Omega XL. Although the supplement does not seem to interact with other medications, it is best to let your doctor know if you are planning to take Omega XL. The supplement can be purchased from the manufacturer’s official website or Amazon. On their website, the first bottle costs $39.95 and comes with a free bottle. Each 60-capsule bottle is good for one month. Completing an order on the official website will automatically enroll you in their auto-ship program. This means your credit card will be billed monthly and you will automatically receive a new bottle before your supply runs out. This is stated on the checkout page before you complete your order. They ship to the US and Canada. If you are from another country, you can email them at [email protected] to place an order, or simply search for this product on Amazon. However, Omega XL is sold on Amazon at $75 for a one-time purchase. The company offers a 90-day money back guarantee without the shipping fee. For a refund, you may simply call the customer care department at 1-800-488-8082. Omega XL is being manufactured by Great HealthWorks. They are a well-known health and wellness manufacturer. This company claims that Omega XL has gone through 30 years of clinical studies, but we cannot find evidence of this claim. They are currently located in Lauderdale, Florida and can be contacted by phone at (800) 609-1656 or by email at [email protected]. 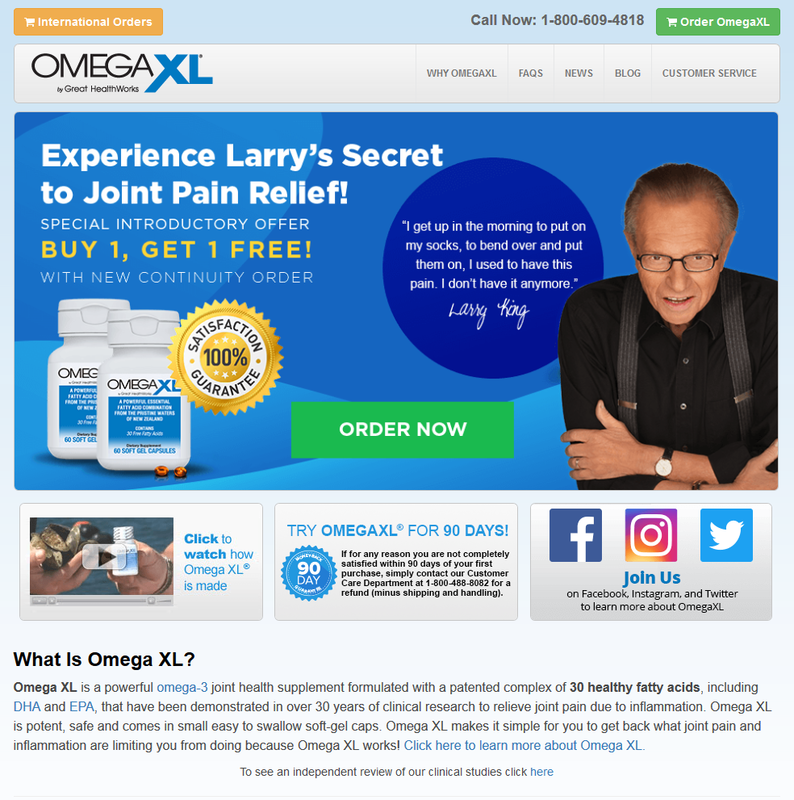 This company was started by Ken Meares and Miles Dupreé with OmegaXL as their first product in 2003. Since then, the company produced more than 30 other supplements. Great Health Works has a BBB profile with an A rating with 99 resolved complaints since 2010. Read older reviews for this product. Gave this as a gift for my father. He’s been suffering from joint pains for years now and is having a hard time walking. Now after one month, he’s not using his cane at home anymore. He started walking around with no problem, although he thinks he needs to bring his cane whenever we go out. Overall, this is a good improvement. He seems much happier and I’m happy that he has lesser pain now. Price is totally worth it. I have been on another fish oil for a while but it doesn’t seem to work. I’ve been on this for over a week now and I am feeling better now. My joint pains are bearable. In fact, they don’t feel so painful anymore, much like uncomfortable. I take it with a medication prescribed by my doctor for joint pains. Used it for two weeks and I felt a little improvement in my chronic pain. I’m glad I started using this because I have had chronic stiffness in my hand. Now I feel more comfortable. Too bad it is a little pricey. I have had a severe chronic pain for years now and I didn’t notice any benefit from drinking this oil. For those who do not have serious pains, this may work because of the ingredients. My mom purchased OmegaXL from their website, but she cannot finish the bottle as it gives her diarrhea and gas. I asked for a refund some time ago and I originally thought that they are already processing the request and would stop sending bottles. Now we have 15 bottles at home and my mom’s credit card keeps getting charged! I called the bank but they are unable to cancel the subscription.